The Taker by Alma Katsu has to be one of my best reads of 2011. The minute I put it down, I had the urge to pick it up and re-read it, though the mystery had unraveled itself for me. The Taker is not like anything else you’ve read before. I say that almost about a lot of books I read, however this one truly takes the cake. The story centers on Lanny, who has become immortal. I will not reveal how and spoil it for you. That’s for you to read and figure. The book begins when Luke, a small town doctor in Maine is drawn to Lanny, who has admitted to a murder. While helping Lanny, she tells him the story of her life and love for Jonathan, and the readers are drawn back and forth in the book from the 1800’s to present day. Lanny’s story is that of love and how she did everything in its name, only to be ensnared and captured and has to suffer as she loves. I am not going to give anything away in the review, however I must say that The Taker had me gasping in certain places and yes I was scared to some extent as well. The Taker is not your vampire fiction or paranormal teenage romance book and I was thanking Alma Katsu for not giving it that shape and form. Lanny’s character is so well-etched that you catch yourself feeling both – angry and sympathetic towards her. On one hand her love for Jonathan is heart-wrenching and on the other, the extent to which she will go to in order to acquire his heart is ruthless. This makes her even more humane and extraordinary at the same time. Katsu never for once misses the spot while telling this tale. Her writing is taut and elegant and it has to be considering the plot that she has invented is fascinating. Love is of many kinds and in The Taker, Ms. Katsu reveals the obsessive nature of love and yet not once will it leave a bad taste in your mouth. The Taker has all elements of a great goth romance and it so delivers. Alma’s writing is beautiful and fluid – it transported me for sure to different worlds and honestly I did not want the book to end. I have been told that this is a trilogy and that has now kept me waiting for the second book in the series. 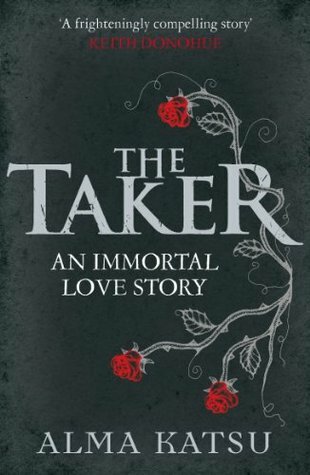 This entry was posted in Books, Fiction, Random House UK, Review and tagged Alma Katsu, Fiction, Gothic, Immortality, Random House UK, The Taker on October 26, 2011 by thehungryreader. Hello everyone! This is me – The Hungryreader and I am hosting this quiz on Booker Prize Winners on my blog today. Please leave your answers in the form of a comment. Please do not forget to include your name and email address. The 2 winners will receive a copy of “The Sense of an Ending” by Julian Barnes and “Pigeon English” by Stephen Kelman. This Quiz is only open to residents of India. Please submit your responses by the 31st of October 2011. The winners will be picked by lots. 1. Which book won the first ever Booker Prize in 1969? 2. Which Thomas Keneally book won the Booker? 3. In which month is the Man Booker prize shortlist usually announced? 4. In 2008 which novel won the 40th Anniversary ‘Best of Booker’ award? 5. Who, at 32, was the youngest ever winner of the Man Booker Prize? 6. Which author famously said that she planned to spend her prize money on building a swimming pool in her house in Provence? 7. In which year were only two books shortlisted? 8. Who was the first Irish novelist to win the prize? 9. Which book is the fastest selling Man Booker winner ever, selling over half a million copies in th the UK alone? 10. Name the Penelope Fitzgerald title that won the Booker? So start commenting and posting your answers. This entry was posted in Book Quiz, Booker Prize, Books and tagged 2011, Book Quiz, booker, Books on October 24, 2011 by thehungryreader. India as a country is not easy to understand. It never has been, with its glaring differences in strata of societies and not to mention the similarities sometimes, it is almost like a maze with no fixed end point. And that is because it is constantly evolving and ever-changing. 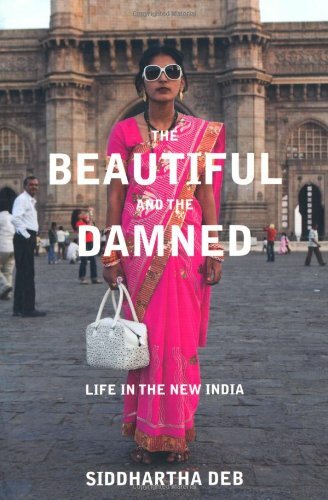 With these changes moving at their own speed and yet the past not letting us get very far, Siddhartha Deb’s book, “The Beautiful and the Damned” – Life in the New India gives us new perspectives to think about. Siddhartha Deb has undertaken something so huge with this book – to be able to unveil Modern India for us. To give the readers a sense of what is Modern India all about – from its economic viewpoints to cultural backgrounds to the way we think and sometimes trying to understand why we think and act the way we think and act. The book is a series of four chapters that touch on Modern India – from the lifestyle of the BPO industry to the state of farmers in the country to the steel and mill workers and finally the women of the country. The first chapter that focused on IIMP and Arindam Chaudhari has been banned from being published in India. So the book does not have that included. So much for modernity and the fact that we live in a so-called democratic environment. Siddhartha Deb is just chronicling his observations so to speak in this book. The fact that the chapters aren’t inter-related is refreshing, keeping the conclusions open to the reader. At the same time, I also feel that probably one book and four chapters aren’t enough to talk about New India. It sure does require more paper and thought space. Having said that, the writing is taut and not too many words are wasted in getting through to the reader. Siddhartha Deb’s writing style is simple and clear. There aren’t too many metaphors, which could be the case while writing this kind of a book. I thoroughly enjoyed this read and to some extent it also gave me a different viewpoint on Modern India – its pros and its cons. This entry was posted in Books, Non Fiction, Penguin Viking, Review and tagged Cultural, Life in the New India, Non-fiction, penguin books, penguin viking, Political, Siddhartha Deb, The Beautiful and the Damned on October 24, 2011 by thehungryreader. An extensive work on Hindus and Hindu Mythology isn’t something which I would’ve read a couple of years ago. Why? Because I would in all honesty find it boring and I am glad that was just a phase when I felt this way. I was introduced to Hindu Mythology and ancient culture by a friend, and I am glad that it gave me a different perspective and at the same time made me want to read more. 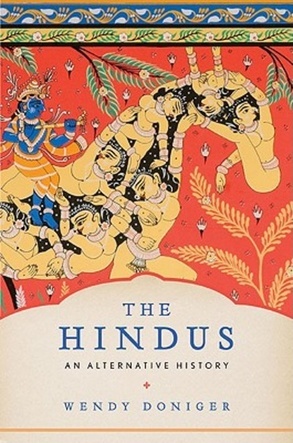 Wendy Doniger’s, “The Hindus: An Alternative History” is a big book about The Hindus. She has through extensive research almost dwelt on every topic in the book concerning religion and caste. 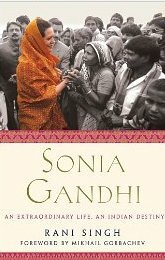 However, the alternative history angle comes from the fact that the book is centred mainly on women and the lower caste. The book isn’t about philosophy. It is more about a social history and of course that would involve various Gods and Goddesses. There are tribal tales as well, which are a totally different take on the regular epics – Ramayana and Mahabharata. I loved how Ms. Doniger brought these to the surface. There is nothing new about the book per se. There are tales and facts and legends that most people are aware about. What is different is the way they have been documented. Wendy Doniger knows how to write and she does so without it being complex or difficult to read. A beginner can read this book and understand The Hindu culture better. Each chapter has several textual examples – which are intended to communicate the beliefs and traditions in the form of myths and legends to the reader. This kind of writing always works with readers who may find the subject boring. There is a lot of imagery in the book which probably could have been cut down on and yet that is one of the ways of better understanding while reading a book of this nature. At almost 800 pages though it does get tiresome to read. I for one had to put it down and pick it up several times before I could finish it completely. Hinduism is an entire universe so to say. It isn’t easy to comprehend or chronicle and Wendy Doniger has done a reasonably good job in merging the old with the new. There will be times when an experienced reader will be tempted to argue with the writing, which is fair enough. At the same time, the book has a quite charm about it despite its flaws. I left taking in a stronger sense of how diverse a tradition Hinduism is and how it evolved over a period of time. There are many ways to represent Hinduism and how the world views it, and yet Doniger has given us another view – which is refreshing and conflicting at the same time. This entry was posted in Books, Non Fiction, Penguin Books, Review and tagged caste, legends, myths, penguin books, penguin india, religion, The Hindus, Wendy Doniger, Women on October 21, 2011 by thehungryreader.